Unusual Piercing Close Up, originally uploaded by isisneros. Laura’s ear piercing. I didn’t want her to get it, but she was determined. You were right, I was wrong. It looks beautiful on you. The life-and-death battle Lacey Filosa faced is just one example of the serious complications that sometimes can result from piercings. Two other examples were reported nationally in October 2006. An infection that set in after an Indiana teen got her breasts pierced for her 18th birthday forced doctors to remove her left breast and take out lymph nodes and infected skin up to her collar bone, according to the Associated Press. And the American Medical Association reported the case of an Italian teen who, after getting a tongue piercing, complained of pain so bad that she felt as if she were having electrical shocks to the face. The pain vanished two days after the metal stud was removed from her tongue. Most of the time, piercings cause only minor irritation, not life-threatening complications, said Dr. Donna Meltzer, residency director of the Department of Family Medicine at the State University of New York Stony Brook. She wrote a review on the medical problem piercings have caused, which appeared in American Family Physician, a medical journal, in 2005. The potential for infections after tongue piercings is heightened for a number of reasons, she said. These include: the high number of blood vessels in the tongue; that the tongue can’t be sterilized as effectively as skin; and that the mouth has many types of bacteria that aren’t typically found with skin infections. Pain and swelling following a tongue piercing can be a sign of infection, she said. And with mouth infections, “you get a fair amount of swelling you don’t see in some other body parts,” Meltzer said. Blood infections diagnosed after various types of piercings have damaged heart valves. “It can be quite devastating,” Meltzer said, often requiring open-heart surgery, a new heart valve and lifelong medical care. Yet even as a fellow professional who understands all this, Dr. James Erhardt, Lacey’s Everett physician, said he still doesn’t know why her infection grew so fast and was so serious. But one of the bacterial organisms in her mouth “which normally wouldn’t have been that big of deal just took off,” he said. Once the germs made the jump from the mouth into the lymphatic system, it “just kept growing,” he said, passing into the teen’s neck and chest. Apprentice at Easton Avenue’s Revolver Tattoo offers special price for those willing to get piercings under professional supervision. Rutgers College alumna Ashley Carment needs your help. The night of homecoming, she pinned up fliers around College Avenue promoting her new piercing apprenticeship at Revolver Tattoo, a piercing and tattoo shop located on Easton Avenue. With one year of piercing experience under her belt, Carment hopes the fliers will encourage volunteers to come to Revolver and let her pierce them for the price of the jewelry only, with no cost for the piercing itself. The jewelry can be as inexpensive as $15 as opposed to the normal prices of piercing, which range up to $80. 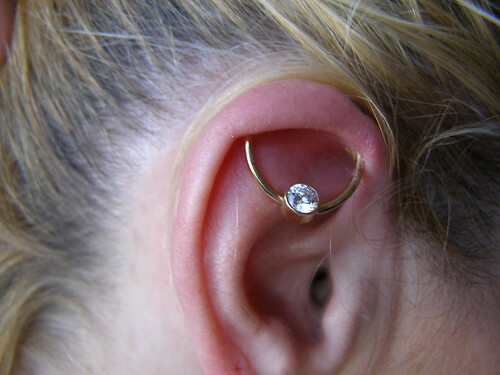 Each piercing Carment does is supervised by Revolver’s professional piercer, Todd DiPopolo. So far, Carment has done a variety of different piercings on volunteers, including earlobes, ear cartilage, nostril, eyebrow and lip. She will continue to learn numerous types of piercings, DiPopolo said. Working six days a week, Carment is taking walk-ins for piercing. As DiPopolo’s first apprentice, Carment has at least one volunteer every day and a steady flow of business. Rutgers College sophomore Asmi Patel volunteered to have her nose pierced by Carment for the price of $25. Previously an indoor produce market facility, Revolver Tattoo serves customers with tattoos and piercings seven days a week. Sandwiched down a narrow hallway between Noodle Gourmet and The Lazy Shopper on Easton Avenue, the shop will have seven working stations, one piercer and five tattoo artists as of next month. There are two apprentices, Carment and Evan Lindemann, who has been a tattoo apprentice for the past month. The shop welcomes anyone with interest in different forms of art. Owner Chuck DeNisd described the shop’s plans for further development to include the creation of new sections for clothing sales and an art gallery. While all the clothes will be for purchase, only some artwork will be sold. “Once we establish the art gallery, we will showcase specific Rutgers students’ artwork on monthly rotations,” DeNisd said. Piercing apprenticeship regulations are set forth according to the Association of Professional Piercers, which defines the position as “a specific period of guided progress through the basic, intermediate and advanced levels of piercing training,” according to safepiercing.org. In addition to supervised experience, such as Carment’s, the APP requires apprentices to attend a blood-borne pathogens training class, a first aid/CPR class and learn about sterilization, disinfection, cross-contamination and other safety issues before piercing. In the News – Talk About Shooting Yourself in the Foot!